The Preference Panel for Acorn is located under Acorn ▸ Preferences . There are five tabs labeled General, Guides, Advanced, Fussy Stuff, and Registration. The General tab includes preferences for Acorn such as turning on and off the startup window menu, setting your canvas origin to top left, and displaying undo/redo notifications. 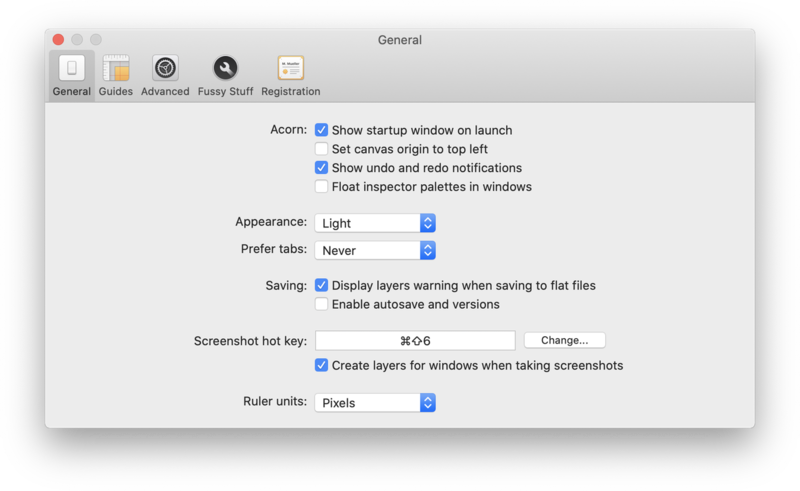 There is also the option to change the hot key for taking a screenshot in Acorn, the option to turn screenshot layers on and off, and the choice of ruler units (pixels, centimeters, or inches). You can also enable autosave and versions. This is the tab where you can set your default settings to snap to guides, canvas bounds, grid, layer bounds, and shapes. You can also set the default grid spacing. The Advanced tab gives you options to change the background color of full screen mode, as well as options for trackpads including zoom, pan, and rotation gestures. You can choose to keep shapes selected for editing and select a preferred file actions image format. You have the option to automatically check for updates when you open Acorn. 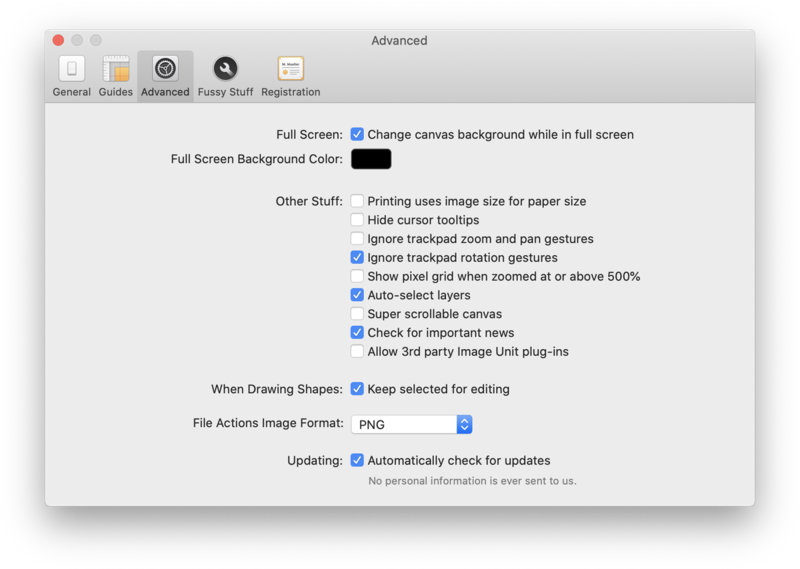 Other options include choosing to have a super scrollable canvas, hiding cursor tooltips, printing using the image size for paper size, and showing the pixel grid when zoomed at or above 500%. 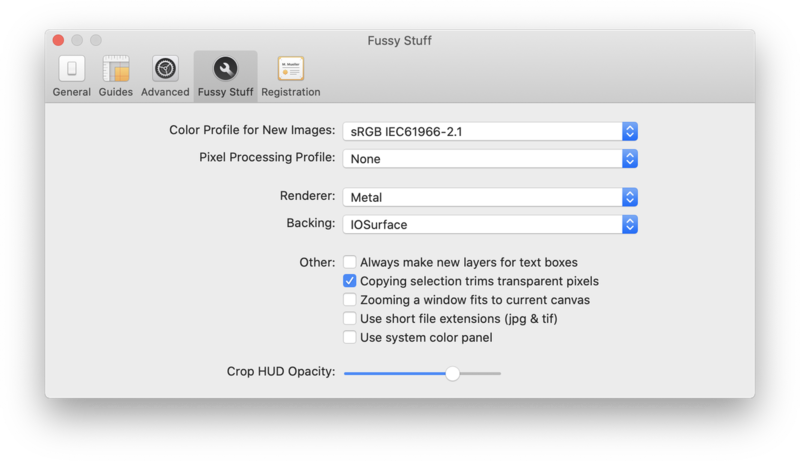 Here you will find options to select the default color space for new images, and the default working color space. You can alter the precision brush slowdown speed and chose to always make new layers for text boxes. Other options include changing the tool icons to monochrome, and altering the crop HUD opacity. This is where you enter your name and registration number for Acorn. Once your registration number is entered, it will be saved here for future reference. There is a link to the Flying Meat store where you can purchase Acorn, and a link to request lost registration numbers. The registration tab is not present in the Mac App Store version of Acorn.